The RainMachine checks weather forecasts every six hours and adjusts watering according to humidity, wind, rain, and temperature. You can’t exactly buy rain on Amazon but you can buy the RainMachine. 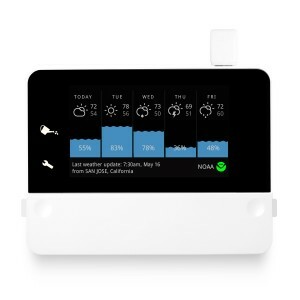 This weather forecast sprinkler controller talks to the NOAA weather satellite service to find out about the coming weather and changes the amount of water the different areas of my garden get accordingly. It replaces my old traditional sprinkler controller that watered the same way, day in and day out. I mounted the RainMachine controller on the garden tool room wall where the old sprinkler controller went and connected the same old wires – just transferred them over. And now I can see which zone is which, spelled out on the display. On the RainMachine app on my phone I found my RainMachine and the same information I had just entered, even played around with turning the sprinklers on and off from my phone manually. It’s password protected, so I could enter a whole different setup for my rental property. I’ve been using the RainMachine for about a week now and I’ve already saved water. We had an unexpected few days of humidity. On my RainMachine phone app I looked up “History” and sure enough, my watering duration was reduced during those days. So I just let the RainMachine do its thing. And if the WiFi goes down, it has a week’s worth of NOAA weather forecasts stored for my particular 1.5-mile area and stores local historic weather data too.